After crossing the main road at Roneo Corner, the Rom is allowed to return to being a river rather than a concrete channel. Initially it's a slow transition, up a trackway past the YMCA, but then green banks open out alongside yet another patch of recreational space. Despite the lovely weather Grenfell Park is not over-occupied, my visit interrupting one middle-aged couple being amorous on a bench, and absolutely nobody else. I can only assume that Havering's children don't go running around outdoors any more, or aren't allowed to. An unsigned path leads through a thicket to an extensive riverside meadow, which I follow with increasing joy at being the only person here. Eventually the grass tapers out and a narrow path weaves into a strip of woodland beside the meandering river. The path is well-trodden enough that it must lead somewhere, but there are no clues as to precisely where. Fingers crossed. At one point an earth bank appears to my left, so I scramble up and am surprised to find myself staring at a young driver through a stationary windscreen. She seems reticent to turn left and move on, down what looks like a minor private road serving absolutely no houses at all. I later discover that this peculiar facility is the Cardrome Learner Centre, a 12 acre network of pseudo-roads for the benefit of those learning to drive. Opened in 1955 (and it looks it! ), users can hire a car or bring their own - ideal for any not-yet-17 year-old keen to get behind the wheel. And on the far side is the Rom Skatepark, Britain's only Grade II listed skatepark, unchanged since 1978 and built from seamless pressurised concrete. A series of hollows and ramps provide considerable challenge, including an obligatory halfpipe and the iconic Vertibowl. Alas the surrounding wall means you'll only catch a glimpse from a passing double decker, or satellite mapping, or even better by getting out your board or BMX and coming down. It's here or hereabouts, at the foot of Harrow Lodge Park, that the Beam River officially begins. The Ravensboune joins the Rom unseen, having disappeared beneath the hillside after pooling in the park's (rather attractive) central lake. This is also where my progress south switches from the Havering to the Barking and Dagenham side of the stream, at a single track lane leading to some riding stables, in what feels very much like the middle of nowhere. I'm negotiating the hidden delights of The Chase Nature Reserve, while to my right is Eastbrookend Country Park, a vast tract of gravel pits transformed into public space 20 years ago. At this least-accessible end I find a group of grazing horses, and also Britain's rarest native tree, a Black Poplar inside its own fenced-off enclave. There are also other people - it's been a while - most of them out walking the wolves that pass for dogs in these parts. The Beam River's progress feels wonderfully natural, through reedy shallows along banks strewn with manure, until the stream meets the District line and disappears through an arch beneath the tracks. 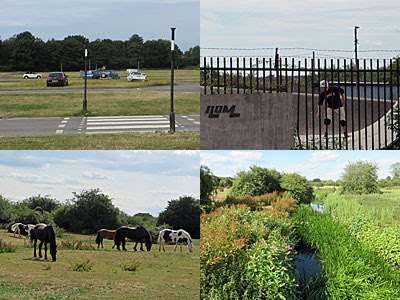 If you've ever ridden out towards Upminster you'll know The Chase Nature Reserve as the big green gap between Dagenham East and Elm Park. There's only one footbridge across too, in a not entirely accessible location, screened off more vehemently than usual to prevent local youth from damaging passing trains. The Beam is readily spotted on the other side, with a further bridge leading to yet another floodplain park where Havering dare not build. On the B&D side I'm left to wander flourishing riverbanks tinged with summer's red, with the occasional weir and stepping stones, again wondering why nobody else is out to enjoy the scene. And finally a road! There's been no other through road cross the river since Roneo Corner over two miles back, which just goes to show how much of a barrier a natural waterway can be. This particular dual carriageway links Old Dagenham to South Hornchurch, the latter blighted by a large landfill site on the eastern riverbank. Thankfully the footpath follows the western bank, entering the Beam Parklands, a major flood prevention scheme completed in 2011. To the untrained eye it looks like a bowl of woody parkland, but in fact there's sufficient drainage capacity here to fill 180 Olympic-sized swimming pools should the Thames come knocking. Also present are the remains of a canal, the not so legendary Romford Canal, on which work began in the 1870s but was never completed. This is the wrong time of year to see it, dry and overgrown, but a rough indentation can be clearly seen where footpaths cross the former channel. Another (brief) river joins the Beam here, the Wantz Stream, arriving in a blaze of colour through a stepped concrete weir. Here too is an fenced-off sluice, installed by the Environment Agency to permit a gap in the flood defences. I shouldn't have headed this way to escape, the gate at the end was locked, so I was forced to nip up and over into one of the adjacent protected estates. And I'd not be getting much further after that either, sorry. The Beam's last three quarters of a mile run through private land, the former Ford Dagenham car works. 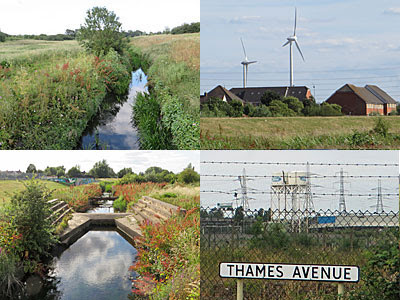 This vast post-industrial swathe now includes Eurostar tracks, a large Tesco distribution centre, the elevated A13 and what remains of Ford's operations, including car parks full of imports and the odd giant windmill. One day there may be 5000 homes and a new station here, Beam Park, but don't count your chickens. Until then the Beam reaches the Thames unseen, except perhaps from Belvedere on the opposite shore, but let's not go there.